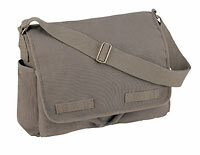 These rock-hard laptop bags from Oakley would appear more at home dropped into a war-zone rather than carried on the bus. They do however score a high amount of both ‘geek’ and ‘cool’ points. Just the thing to put your laptop in when you turn up for the next “Battlefield 2″ LAN party. We applaud the enthusiasm of all these handbag and 24 fans. 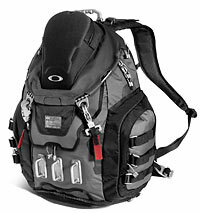 However, we cannot help but note a somewhat critical distinction between the Oakley bags detour99 and friends are fawning over and the bag tastes of their role model and supposed laptop-bag designer, the fictional sorta-superhero Jack Bauer. Each Oakley pack has its own premium features. If you can’t choose between them, get them all in a single pack that offers every conceivable innovation. From the mobile phone pocket to the padded sleeve that holds widescreen laptops up to 17”, the Kitchen Sink Pack gives you everything you need to haul your gear. The top storage compartment is fleece lined and compression molded, perfect for protecting eyewear — or use it for a media player and take advantage of the headphone port. Cable zipper pulls let you add a lock to secure the main compartment. The mid-body access flap includes an inner organizer, and a compartment at the bottom has drainage ports for wet or soiled items. You also get plenty of pockets, attachment points and tie downs. The Kitchen Sink Pack sells for $175 and appears to bristle with threatening metal, in the form of clips and anchor handles, the purposes of which are not so clear, though perhaps they could be used for some form of backward rock climbing. We can’t help but imagine that carrying a bag clearly dotted with attachment points might become somewhat counterproductive in the event that the wearer, in full pseudo-counter-terrorism mode, attempts to escape some attackers, say, who might carry hooks. So let’s contrast. The Jack Pack was pioneered by schoolchildren in Denmark, is made of soft canvas, and has no internal padding or exterior markings save a zipper and two flaps. Yet somehow, in his imagined nascent career as purveyor of laptop backpacks, Jack Bauer is going to decide that bags should be festooned with buckles and gizmos and padded to coddle expensive sunglasses? Let’s get this straight: Jack Bauer’s bag is simple and inexpensive. He carries everything but the kitchen sink inside it. While it looks like he might have only a sweaty towel and some jogging shorts in there, he regularly pulls out of it some rather strategic weaponry and devices. Dramatic tension arises from that simple contrast. The Kitchen Sink Bag, on the other hand — and other “tough” looking bags like it from Oakley and many other manufacturers — look like they might be weapons themselves . . . or at least cases for them. What’s inside could only be a letdown. A lot of imagined “protection” for your cute little iPod, no? This entry was posted on Friday, June 30th, 2006 at 12:12 pm	and is filed under Backpacks, Bag Contents, Commentary, Details, Gadget Bags, Laptop Bags, Law Enforcement Gear, Man Bags, Manufacturers, Military Bags, Public Image, Role Models, Shoulder Bags. You can follow any responses to this entry through the RSS 2.0 feed. You can leave a response, or trackback from your own site. Sorry, but I’d never buy one of these bags. Canvas may sound “cool,” but way back in the day when I was going to school, Army surplus canvas schoolbags and knapsacks never lasted more than a school year and often wore through at the corners within months. I don’t want to have to buy a new bag every year anymore, not when durable nylon, Cordura or ballistic bags can be bought for only a little bit more. Looking “cool” just isn’t worth money to me anymore. where can I find jacks jakcets …? Thanks for your dedication to the man-purse cause with your thorough analysis of my Jack Bauer Digg. Yes you’re totally right that his bag of choice is unflashy and made of humble canvas. I stumbled across the Oakley page in a hunt for a new laptop case and thought I would share with the world (or at leat the digg community) my discovery and was trying to think of something punchy to draw diggers to it. I didn’t end up buying one in the end as it was too pricey and ended up going for and Kensington Pro Notebook “Saddlebag” (http://us.kensington.com/html/2226.html) Nothing too flashy, but I kind of liked the “hidden” draw at the base of the bag.